I have yet to update our family gallery wall with a single picture of Collins. You're familiar with Collins, right? In case you aren't, he's our 2-year-old last little baby and in those two very fulfilling years he has yet to grace the walls of our formal living room. If that isn't a #ThirdChildProblem, I don't know what is. I know I've raved about the Kodak Moments app before but I can't tell you enough how much it's changed the way I capture and share family memories. In the few short weeks that I've been actively using the app, not only have I created a special space to save and share favorite family moments but I've also started putting together a photo book of the boys' summer escapades. 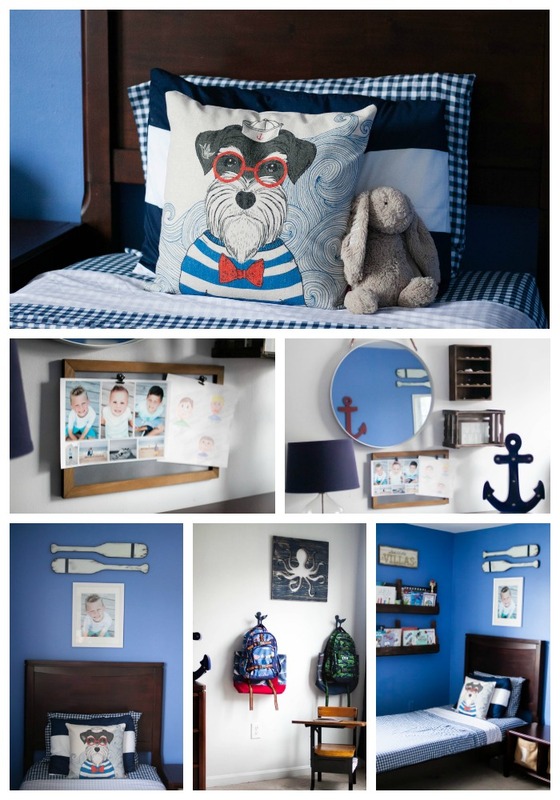 My most favorite project to date, however, was the photo collage I designed for the big boys' shared bedroom. 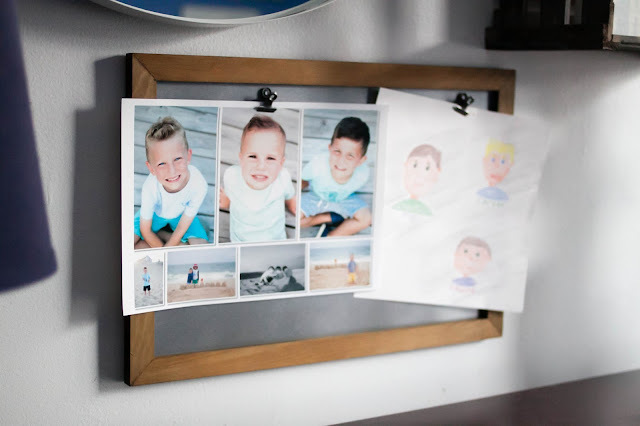 From start to finish, it took less than 5 minutes to choose photos, create the collage and order from a local Kodak Alaris kiosk. The best part? I was able to do all of this while sitting on the couch, right from my phone. 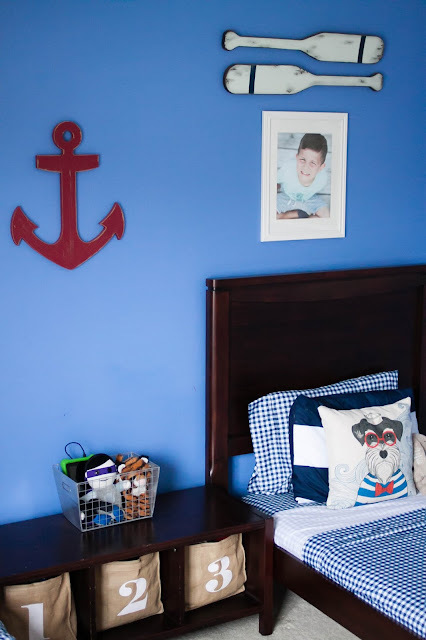 I love the personalized touch this collage adds to the boys' nautical-themed shared bedroom. For the longest time their dresser sat bare with nothing above it to make it feel "pretty." 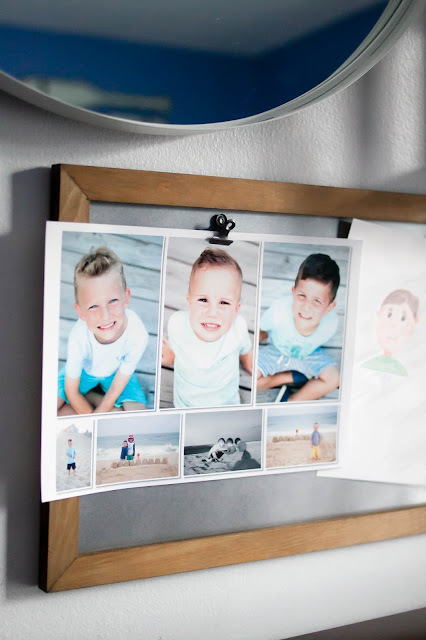 The decorative photo collage not only makes it feel homier but also reminds the boys of all the fun they've had at the beach this summer! While we're in there, here's a few more pictures of Carter and Maclane's shared bedroom. The boys began sharing a bedroom at 4 and 2 years old and today, two years later, we've not once regretted our decision. While they aren't required to share a bedroom currently, it does allow us to have a fourth bedroom available to guests, particularly my parents, when they come into town. I have no idea what the future holds and whether or not one of the boys will begin to crave privacy and independence, but until they do, Carter and Mac really do love sharing a room! 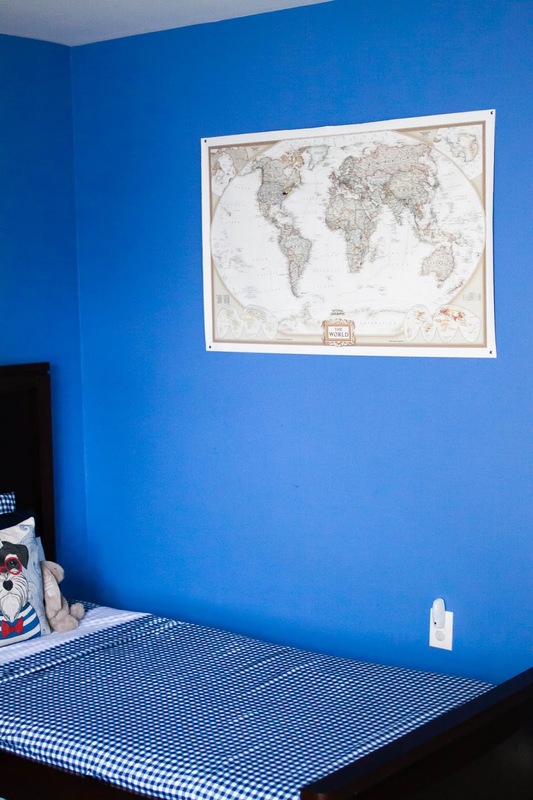 My favorite part of the large world map pictured above is that two push pins mark where we live and where my parents live. Every night before bed Mac asks me to point out our location and whether or not it's night time in New Jersey where my parents are. 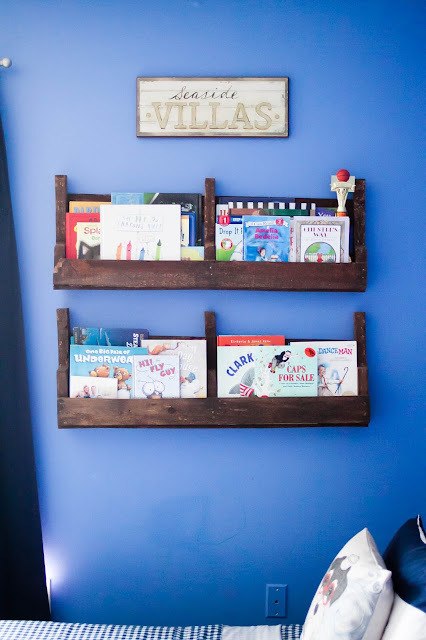 Carter's side of the room looks similar to Maclane's, the only exception being the DIY pallet shelves that hold some of their current favorite books. 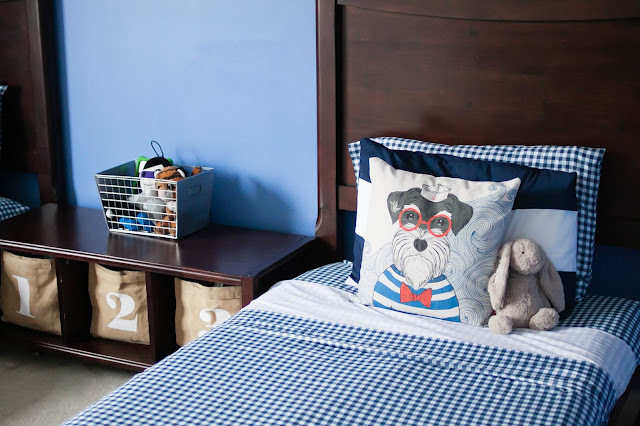 While my plan was to separate the beds with a colorful mid-size server or buffet piece (one that would hold a lamp for reading and their nightly Dixie cup of water), the toy storage piece from Land of Nod is a great stand-in and an even better place to throw all kinds of stuff the boys insist on keeping in their room. The storage baskets hold a myriad of tiny toys- mostly ones that come with a trillion pieces. Currently you'll find them chock full of LEGOS, Magformers and Hot Wheels and I love how easy it is for the boys to clean up their mess. Just slide, scoop and toss it all back into a basket! The metal basket was part of a birthday gift that I re-purposed it as a stuffed animal catch-all and a safe place for the boys to charge their Kindle tablets. 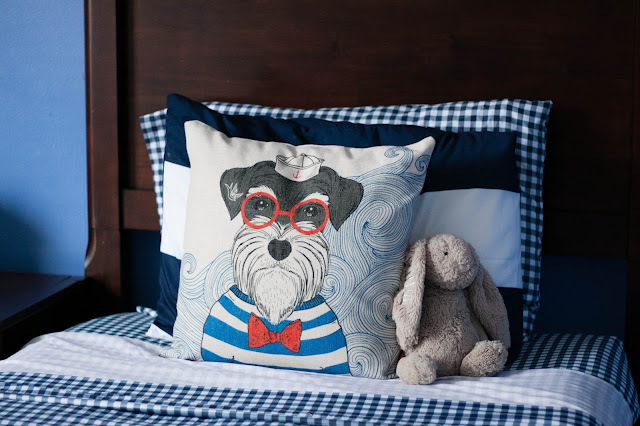 One of my top three favorite accents in their shared sibling room is undoubtedly the cute cartoon sailor dog pillows that sit atop each of their beds. They were a steal on Amazon and the perfect playful accessory to their nautical themed big boy room. 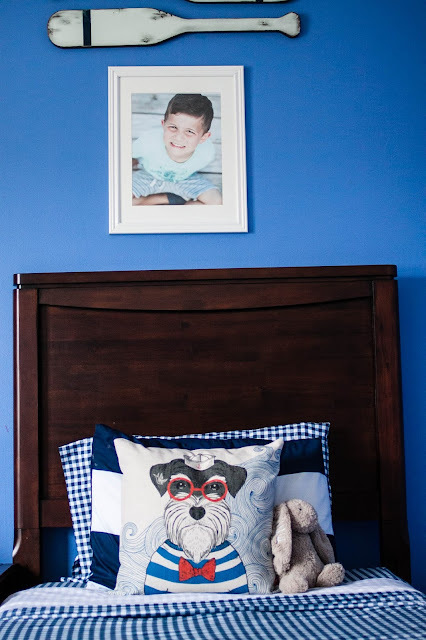 I drew much of my inspiration for this room from this one Pinterest pin. 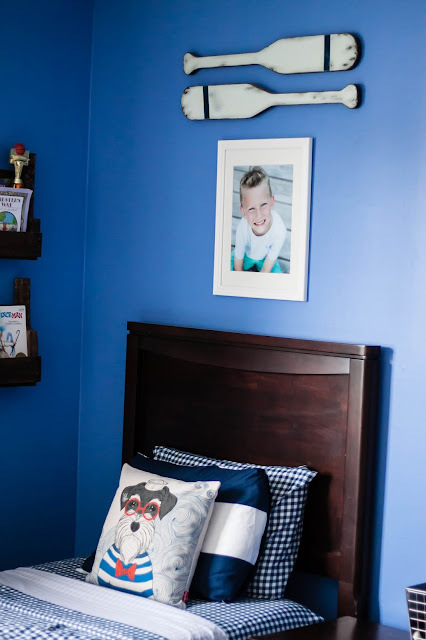 I absolutely adored the idea of placing a framed picture of the boys above their beds and while it took me over three years to swap out the pictures for more current choices, I really love how it personalizes the space. The hand-painted oars were purchased from a wonderful seller on Etsy. 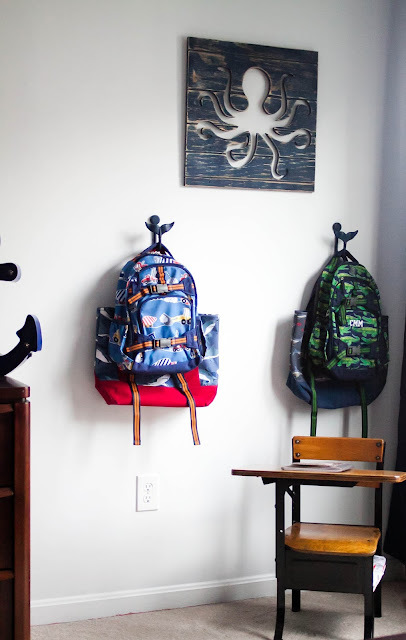 On the wall across from their beds sits the only set of drawers inside the room along with a sweet little "study nook.". A second dresser is nicely concealed in their (generously sized) walk-in closet. 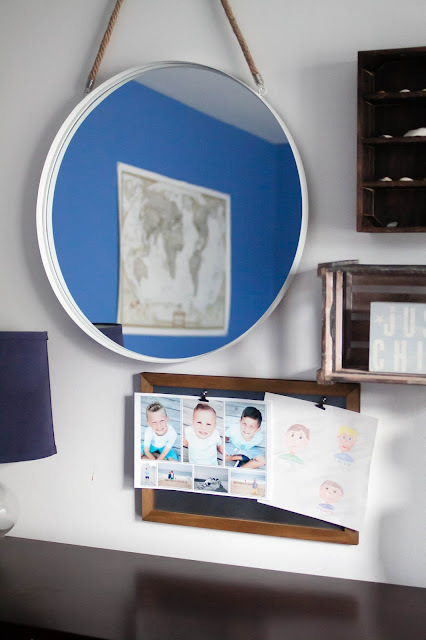 The space above their dresser sat blank for the last several years and while I grew impatient with its bareness, I'm so glad I waited to decorate it until I found pieces that I was 110% in love with. Patience is a virtue, my friends. Or so they say. 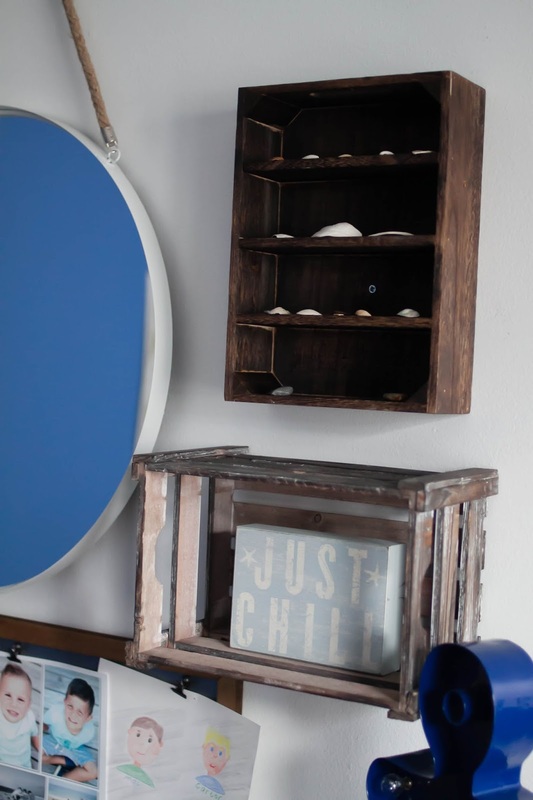 The magnet board and anchor marquee were found at Target and the mirror along with the two weathered crates and "Just Chill" sign were found at HomeGoods. The seashells are courtesy of Ocean City, Maryland and two eager and adventurous treasure-hunting boys. I love that as they grow, I can swap out those items for other trinkets they collect. 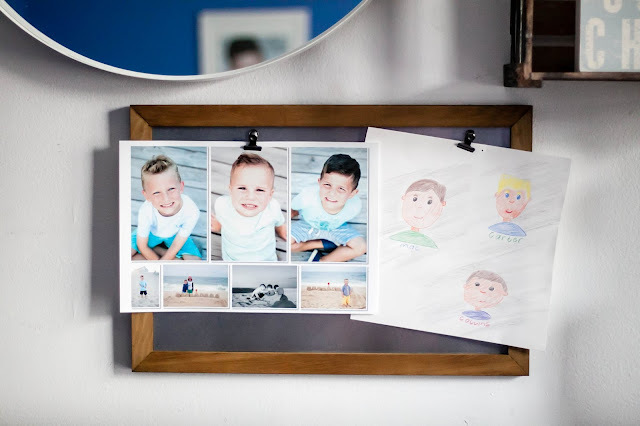 I sketched those vignettes of the boys one day while we were playing "school" and they insist that it gets displayed in their room front and center. I love that they are so proud of my silly amateur doodles! Finally, that vintage little school desk was a fantastic local Facebook yard sale find! I only wish I had found two of them because the boys fight over who gets to sit in it like cats and dogs! The blue wall color is Ships Ahoy by Valspar (color matched to Behr Premium brand) and the Gingham plaid sheets were another great find on Amazon. They are supremely soft and cost less than $15 for a single twin set! 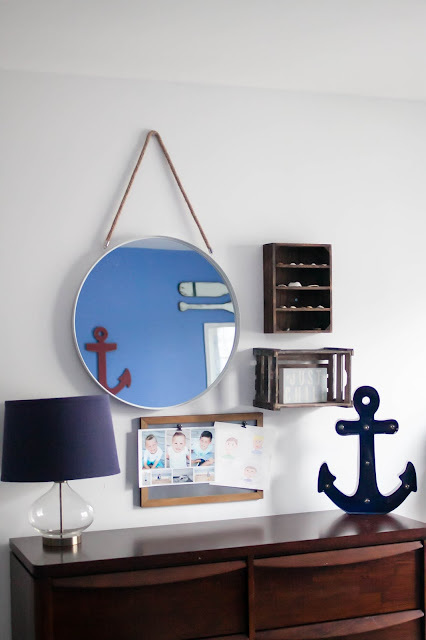 Last but not least, the blue octopus-shaped wall cutout and red anchor were both random finds at Hobby Lobby last year. 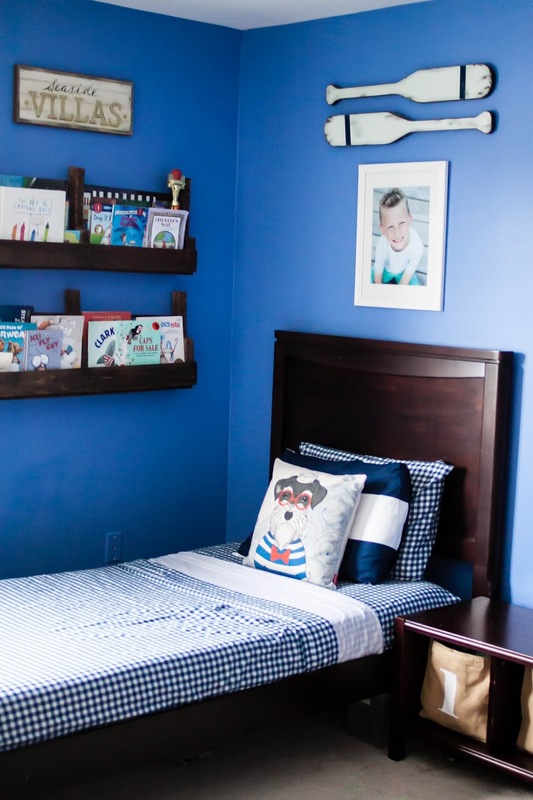 I had so much fun decorating this space for two special big brothers and it brings me such joy knowing they appreciate it as much as I do. If only they could keep it as clean, amiright?